Recently you will have seen in the paper a picture and a write up regarding the annual wreath laying ceremony for Sir Richard Hotham. I also regularly mention this man’s name so this week I thought we should look at the life of the man who is credited with founding this seaside resort. Richard Hotham was born in the city of York on 5th October 1722 and was the youngest of five children to Joseph and Sarah Hotham. His birth date was shown on a plate affixed to his coffin and noted when it was moved in 1879. There are no specific records of his formative years, however he eventually moved to London and it is thought that he became apprenticed as a hatter. Hence he traded as a hatter and hosier in Serle Street, Lincoln’s Inn and it was from here that he was known to have advertised his trade by means of small round copper tokens. Richard Hotham married Miss Frances Atkinson on 1st December 1743. She was aged 25 years and it is thought she might have been the daughter of his employer at the time. Their wedding took place at the chapel within Chelsea Hospital. They were later to have one son called John in 1751 sadly, however, he died after only one day. In 1746 Richard Hotham set up in business selling hats, the trade for which he is mostly remembered as ‘Hotham the Hatter.’ hence the name of the public house The Hatters in the Queensway. By the 1750s he moved to improved premises on the corner of the old Hungerford Market in the Strand, the site of today’s Charring Cross Station. It was during this period that Richard Hotham issued copper tokens to advertise his hat selling business, and they bore the Searle Street address. For a number of years it was believed that Richard Hotham only had one wife, Francis, however recently it has been discovered that this is not correct. Apparently Mrs. Francis Hotham died in 1760 and was buried on 14th August of that year. Within eight months on 7th April 1761, he was to re-marry this time to Barbara Huddart of the parish to St. Margaret in Westminster. Barbara became Lady Hotham following Richard receiving his Knighthood in 1769 when he was only aged 46. The knowledge of his second wife was to change much of the known history of Sir Richard Hotham and only goes to show, that research should continue, even after all the facts seem to be known! During the 1760’s Richard Hotham joined the East India Company and became known as a ‘ship’s husband’ with four ships under his control. Also around this time he was involved in building property at Merton Place, which was later, the home of Admiral Nelson. He then built Merton Grove, which today would have been near the site of the South Wimbledon Tube Station. For many years during the 1770’s and 1780’s he was involved in the life of his neighbourhood in Wimbledon, being on Vestry Committee’s at his local church in addition to being appointed Sherriff of Surrey and a Magistrate. Sadly his personal life was not so successful and Lady Hotham died on 1st February 1777 aged only 44. It would appear that Sir Richard Hotham also attempted to enter Parliament and was duly elected the MP for Southwark on 15th September 1780. He remained their member of parliament for four years. Following these events his health began to suffer and he decided to spend the summer months at the seaside. At the age of 62 he arrived in our area staying at a farmhouse with Captain Blanchard, who was the Captain of one of his ships. There are some avenues of thought that he may have considered the Hayling Island area before arriving here in Bognor. He returned to Bognor for a second year and then purchased his first piece of land, which contained a farmhouse, for the price of £200 from a George Moore who was a riding officer in the Customs. Once Sir Richard Hotham had decided to stay he started work on building property as he found that the Bognor earth was very suitable for brick making, a fact that had not been appreciated locally. With local labour and materials he rebuilt the farmhouse into a ‘commodious mansion.’ This event was recorded in the Parish register by the Rev. Thomas Durnford, M.A. who was the Vicar of South Bersted, Curate of Felpham and Rector of Middleton. 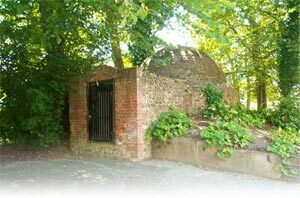 This event occurred on the 18th January 1787 and the entry in the parish records read, “The first foundation stone of a public bathing place at Bognor in the Parish of Berstead was laid by Sir Richard Hotham Knt. At the house called by the name of the Lodge.” Hence Bognor Regis celebrates its birthday annually on 18th January. There are numerous mentions of Sir Richard and his activities in the town one of which states that in 1788 he spent £6,225 purchasing land, eventually he was to own 1,600 acres. At this time he also built Hothampton Place, which consisted of 7 houses in addition to East Row with six houses and both of these constructions overlooked the area today known as Waterloo Square. His work initially began by developing his seaside resort bordered on the one side by the Rife, which was situated between the resort and the village of Felpham. Although he did ultimately buy property in the village itself. In 1789 Sir Richard Hotham became known as Lord of the Manor of Aldwick, when he purchased the second half of the manor from Canon Miller for a reputed 4,000 gns. His building continued when he purchased the dilapidated Fox Inn and built a hotel on the seafront. This was situated at the end of West Street and had stabling for 80 horses and 15 carriages. During all this work Sir Richard Hotham had not forgotten his roots and in 1791 he erected a memorial to his parents in Skelton church, north of York. Visitors were beginning to arrive, and in 1791, which was classed as their first main season the rates for accommodation ranged from 5gns to 10 gns. per week. This was the year, which saw the inauguration of the watering place, known as Hothamton. During the 1790’s there was a lot of development taking place through out the district with Hothamton Cres. being built with 50 rooms and a tea room situated underneath its Dome. Spencer Terrace was a row of 7 houses. 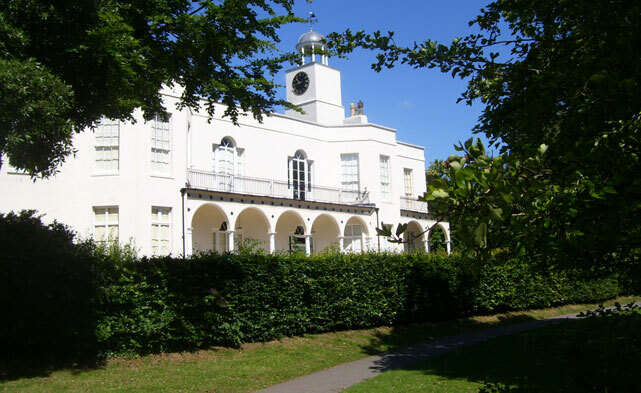 He also built his new home known as Chapel House, which was next to the original Bognor Lodge. On the 12th August 1793 the Duke of St. Albans was in the town to lay the foundation stone of the Chapel, being built to allow visitors to have their own exclusive area for prayer. In 1794 John Thwaites of London installed the distinctive clock, and this fact is clearly noted on the clock, which is still operating today in the tower attached to the house. Sadly by 1795 things were not proceeding well and lodging receipts for the year only amounted to £1,919, 5s. 6d. At this time the town was apparently receiving refugees from the French Revolution. It is reported that over £100,000 had been spent on the resort, although it was still losing money. Royalty were beginning to arrive in the district such as when Lady Jersey took The Dome for the months of August and September, in order to avoid going to Brighton. 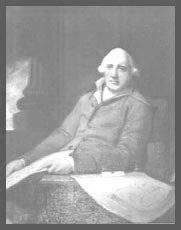 In 1796 he sat for a portrait and this picture clearly shows Sir Richard Hotham sat, with his plans for Bognor below his arm. This picture can still be seen today if you call into the Town Hall. Sir Richard Hotham continued to expand his ideal seaside resort, and continued to wish for royalty patronage. Building work continued, with new constructions rising out of the fields, overlooking the sea. Sadly however the dream came to an end when on the 13th March 1799 he died at his home in the resort, which was his dream.